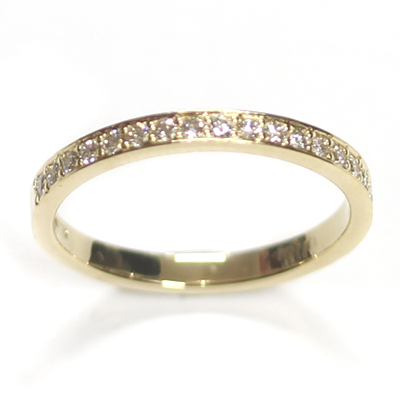 18ct Yellow Gold Diamond Set Wedding Band — Form Bespoke Jewellers Ltd.
A simple and sophisticated, diamond set, yellow gold wedding band. This is a beautiful example of a diamond set wedding ring. The ring is fully diamond set around the whole band with petite round brilliant cut diamonds of matching colour and clarity. The diamonds have been grain set by hand providing an added sparkling illusion too. The ring was cast in 18ct yellow gold to compliment the bride-to-be’s yellow gold engagement ring. The customer also chose for a flat court profile band to ensure a modern look but also a comfortable feel on the inside of the ring. Remember, if you are planning to wear your wedding ring every day, comfort is just as important as design! We love this classic diamond set wedding ring. 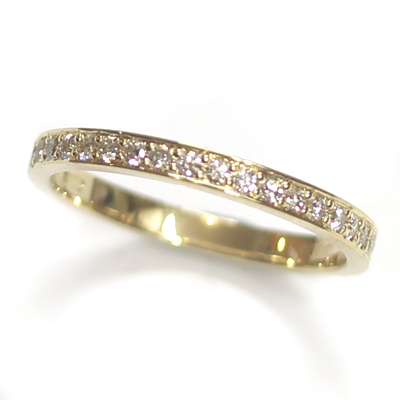 The warm yellow gold contrasts the bright white diamonds beautifully and the whole thing has a lovely delicate sparkle.